RAM EC SILENCED FAN SUPER QUIET QUARTER OF THE ELECTRIC USE. The RAM EC Silenced Fan has exceptional air volume output and emits an incredibly low noise levels for its airflow rating. It uses a quarter of the powers of a traditional AC duct fan. 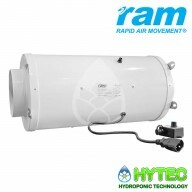 RAM EC SILENCED INLINE FAN 150MM-531m³/hr The RAM 150 mm EC Silenced Fan has exceptional air volume output and emits an incredibly low noise levels for its airflow rating. The Silenced Fan offers- Comes with an IEC lead A multi-phase EC fan motor 50 mm of insulating rockwool Soft-s..
RAM EC SILENCED INLINE FAN 200MM-1078m³/hr The RAM 200 mm EC Silenced Fan has exceptional air volume output and emits an incredibly low noise levels for its airflow rating. The Silenced Fan offers- Comes with an IEC lead A multi-phase EC fan motor 50 mm of insulating rockwool Soft-..
RAM EC SILENCED INLINE FAN 250MM-1617m³/hr The RAM 250 mm EC Silenced Fan has exceptional air volume output and emits an incredibly low noise levels for its airflow rating. The Silenced Fan offers- Comes with an IEC lead A multi-phase EC fan motor 50 mm of insulating rockwool Soft-..